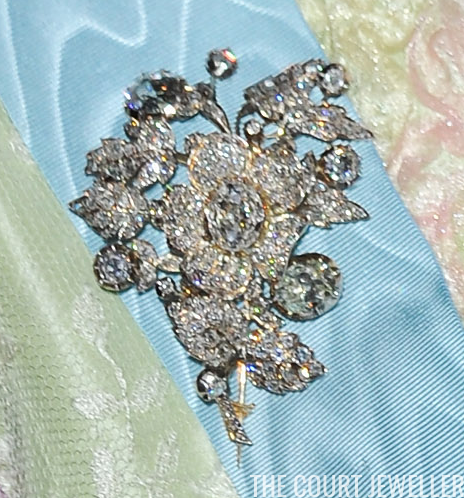 We recently discussed the gorgeous diamond brooches owned by the grand ducal family of Luxembourg, and researching that post made me think of another favorite diamond floral brooch: the gorgeous diamond rose brooch from the magnificent Braganza Parure. The craftsmanship on this piece is just exquisite. This view emphasizes the gold and silver settings of the piece, as well as the masterful pave work on the petals and leaves. And just look at that diamond in the center of the wild rose! Here's what the piece looks like when worn. The delicate design makes it a bit difficult to photograph well when it's not absolutely stationary, but this also gives you an idea of scale and positioning. 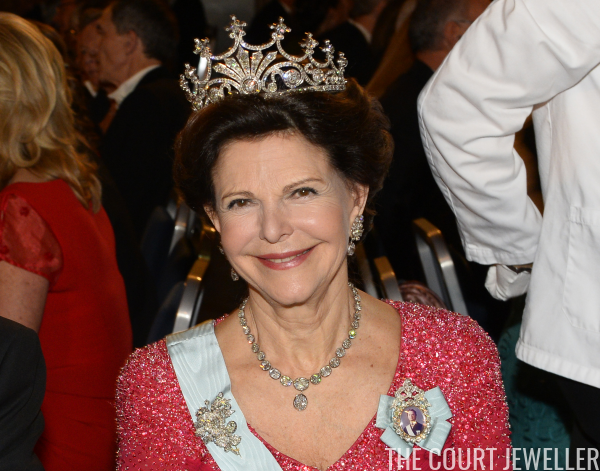 Queen Silvia wears the brooch in various combinations with other jewels, but almost always for major gala occasions. 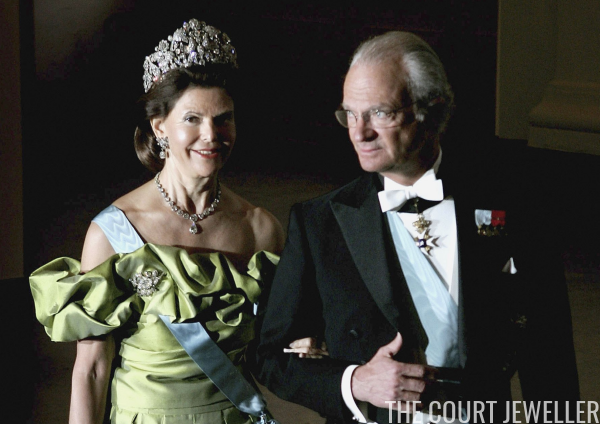 Here, she wears the brooch with other pieces from the Braganza Parure for the celebrations of her husband's 60th birthday in April 2006. She also sometimes wears the brooch for the annual Nobel Prize ceremony and banquet, usually paired with Queen Sofia's Tiara. (See our recent close-up post on that diadem over here.) 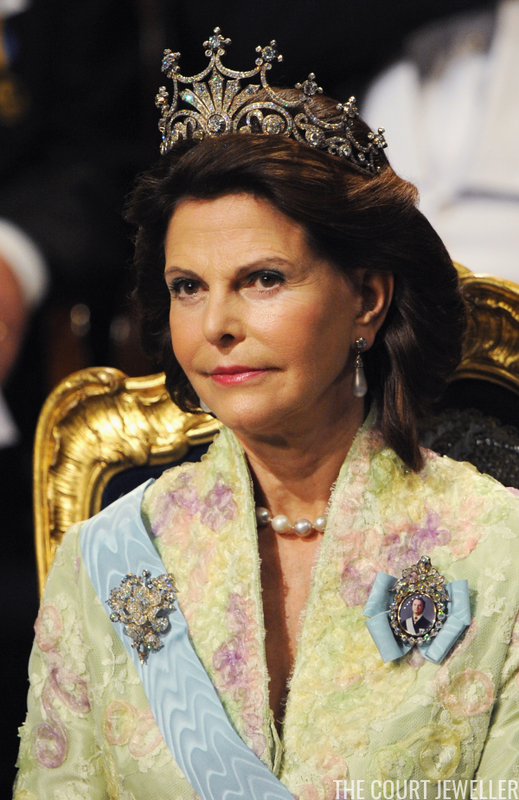 In December 2009, she wore the tiara and brooch with pearls. 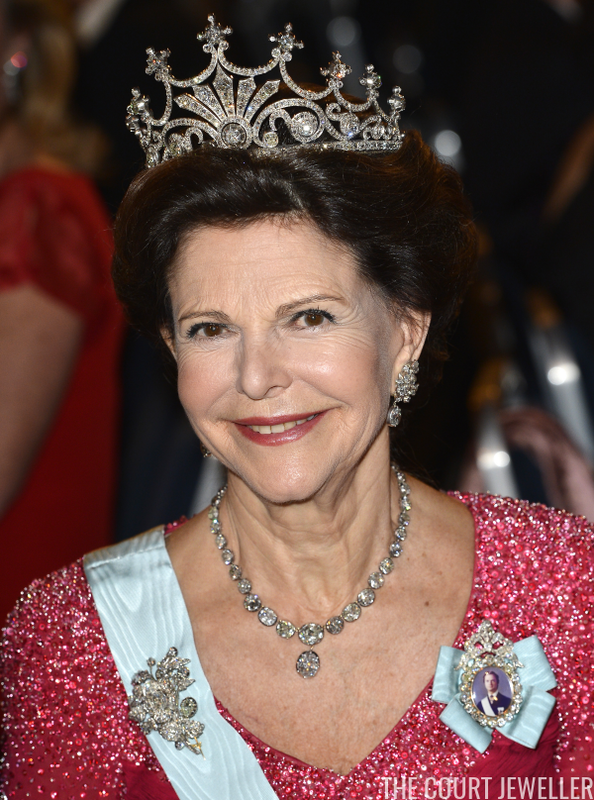 For the December 2013 Nobel festivities, Silvia wore the tiara and brooch with diamonds, specifically earrings and a necklace that are also apparently a part of the larger Braganza suite. 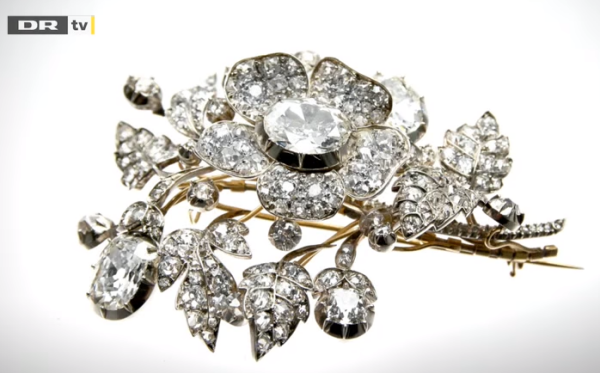 The Bernadottes are always inventive jewel-wearers, so it should come as no surprise that members of the family have also employed the brooch as a diamond hair ornament. 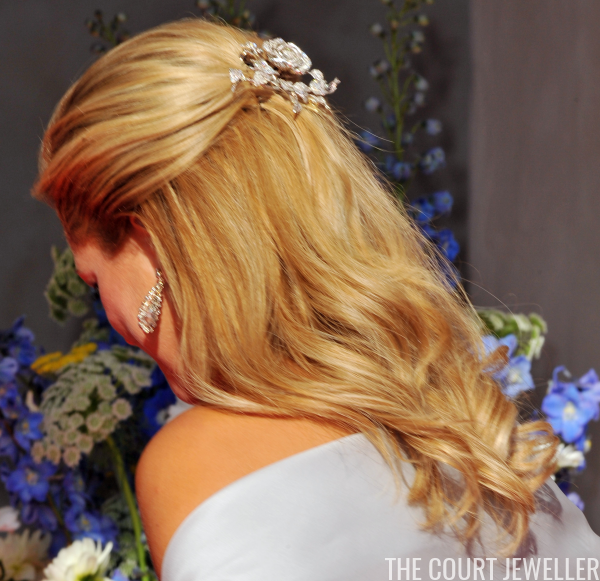 Here, Princess Madeleine wears the brooch in her hair for the pre-wedding dinner and concert given in June 2010 for her sister, Crown Princess Victoria.